Once again, the lawyers gathered at Wisma MCA to discuss on the matters relating to the Lingam tape and the judiciary. Before the EGM could proceed, the quorum of 500 lawyers must be fulfilled. This time was easily fulfilled as by 2.55pm, 553 members signed up. There was a time where the quorum was 1/3 of the members of the Bar (about 12,000 members). Only recently the law was amended to 500 members. There were 5 resolutions debated – 3 relating to the judiciary and 2 regarding to the Bar elections. Once again, it was filled with drama and juicy stuff. The floor was opened to the lawyers to debate on the proposed resolutions. After debating, the president will close the debate and those present are allowed to vote on the motions. Microphones were placed on strategic locations of the floor. Prominent lawyers were seen fighting for the microphone to speak. Before the floor was open to debate, members of the bar were shown the Lingam tape. Many laughed out loud when they heard the words “Correct, Correct, Correct”. Initially I though the EGM was to discuss on the Lingam tape but soon I realised that it was to discuss on the ‘rot’ in the judiciary as a whole. Some senior lawyers revealed some questionable conduct by unnamed members of the judiciary. Some lawyers blamed the lawyers themselves to be the cause in the ‘rot’ in the judiciary. One Malay lawyer went up to the microphone urging that the Bar should not make any moves until the Royal Commission’s finding is finalized. He started his speech in Malay, which is very rare as most speeches are made in English. Immediately after the Malay lawyer ended his speech, he was rebuked by other lawyers which included one Malay lawyer who started off his speech with, “Although I am Malay, I will speak English”. The floor burst out laughing. One of the most important motions was the motion regarding to a suit filed purporting to be on behalf of all members of the Malaysian Bar except for the present president and past president. The suit was to declare that the previous election was void due to certain irregularities. The motion was unanimously passed sending a clear message that the Malaysian Bar does not agree that they are being represented in the said suit. I didn’t stay until the end of the EGM. By 530pm, my colleagues and I left the hall after voting for the second motion. Early June this year, a stray cat came into my house and gave birth to 4 kittens. Instead of kicking them out from the house, we decided to rear them and give them food and shelter. We would pack our leftovers for the stray cat. One day, the stray cat disappeared with its kittens. But few days later, she came back with 3 kittens. 1 kitten was missing was never to be found. 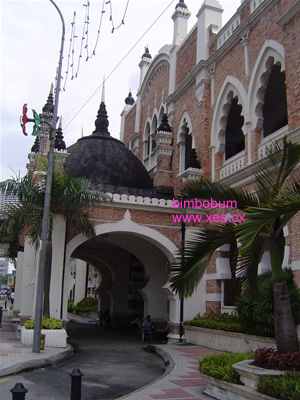 Now that the Kuala Lumpur civil and commercial courts are housed at Jalan Duta’s court complex, the Sultan Abdul Samad building along Jalan Raja have long been abandoned. The old men who have sat outside the building on the pavement during its active times are still there, with their trusty old typewriters, and are still visited by people who need help in ……. typing some documents out for them? Previously, I’m sure they assisted poor summoned defendants in stating their defence in reply to the civil summonses against them. But now, I do wonder what they do. I was walking towards Masjid Jamek and I noticed to my dismay, that building maintenance is not high on our country’s list of priorities. You still see tour buses bringing tourists to Dataran Merdeka and many of them snapping pictures of the building – I’m sure it’s a lovely sight to behold …… from afar. 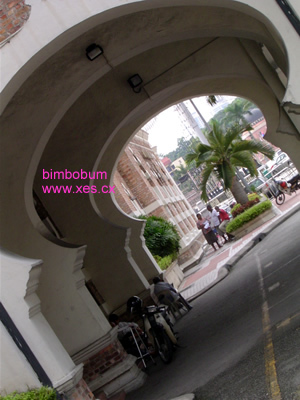 Step closer, or walk along the 5-foot walk, and you’ll catch a glimpse of Sultan Abdul Samad building’s corridors. 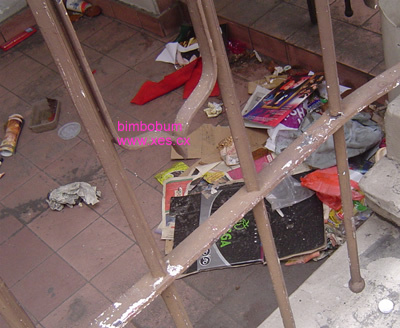 Look at the dust, look at the rubbish. Do we want tourists taking pictures of rubbish as well? 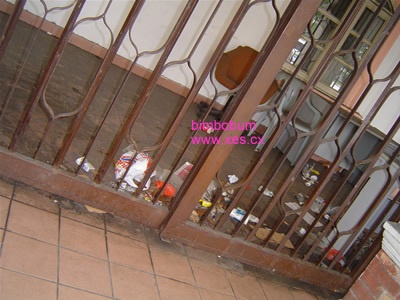 We are proud of our heritage and our new buildings, but for goodness sake, do keep them clean! I can’t remember when we (high school friends) celebrated Khai Fei’s birthday. But this year is definitely a year to be remembered. Hen, Ping, Kiang, Wai Keong & Gf, Him & Gf, Timothy and I gathered at Decanter, Hartamas to celebrate Khai Fei’s 26th birthday. He’s finally in his late 20s. Welcome to the club mate. Decanter is a small pub located in Hartamas. It’s smoky, dark, noisy and full of kids (yes I’m old). Nevertheless, this place seems to be our usual hangout spot. We started off with some beers and ended with a lot of beers and managed to slot in a flaming Lamborghini for Khai Fei. The flaming lambo was served at the bar table. KF was reluctant to go initially but after repeated persuasion, he gave in and finished the flaming in one gulp! Throughout the night, we played drinking games. Wai Keong and Hen were the target of the night. But some went down as casualty as they were caught in the crossfire. We ended the night at Devi’s corner. After couple of drinks, the font of the shop’s signboard read as Doris Corner. Kiang (to Hen): Eh Doris is your former maid’s name right? Kiang (Imitating Hen): Doris! Where’s my food!!?? Doris where my basketball??? Hen: Doris is my mother’s name la!!! We shisa was shared among the gang. But after WK slotted the tube into his nose, some of us were reluctant to smoke it. We went home around 4am. It’s been a while since we hung out that long. Age is finally catching up..
Gone were the days where I though I could withstand any strenuous activities without feeling the aftermath. Recently, I’ve been experiencing soreness on my waist. I suspect it’s due to long working hours without taking enough breaks in between. I went to see a doctor and he said that it may be due to an injury to my soft tissues. To remedy it, he subscribed me with painkillers. I don’t think this would solve the problem as it merely takes away the pain. As I wasn’t convince with the doctor’s method, I went to see a chiropractioner. I had to take half day leave to see the chiropractioner. The chiropractioner is located in one shopping centre. Nicely designed and seems very cosy. I was brought to a small room with a funny shaped bed. Within minutes, the chiropractioner greeted me with a smile. I’m not very convinced that the chiropractioner could really solve my problem. Further, I’m a little bit worried that he’ll mess up my spine! Posted on November 20, 2007 Author xesCategories General16 Comments on Age is finally catching up.. The nick on my jersey is not cheap, RM3 per alphabet! Imagine if you want to put your full name e.g. Abu Ahmad Bin Abu Hassan. Could probably cost more than the jersey. Initially we wanted something else. We were given 2 choices and these 2 choices were posted on jinhan’s website and with waikeong as our model. Unfortunately, our supplier ran out of stock hence we had to settle for Marseilles’ football jersey. Amigo FC’s games are usually fixed on Sunday mornings. If anyone is interested for a game of friendly football, please head to jinhan‘s website! 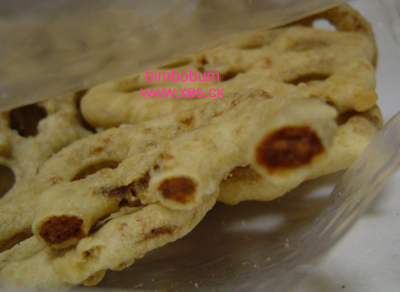 Some time ago, a friend gave me a packet of kuih cincin to try. She told me that it was one of the things Sabah is famous for. ‘Cincin’ means ‘ring’ in Malay, but it doesn’t look like a ring, does it? Perhaps it refers to several rings in the middle of the biscuit. I let some of my colleagues try and they loved it as well! 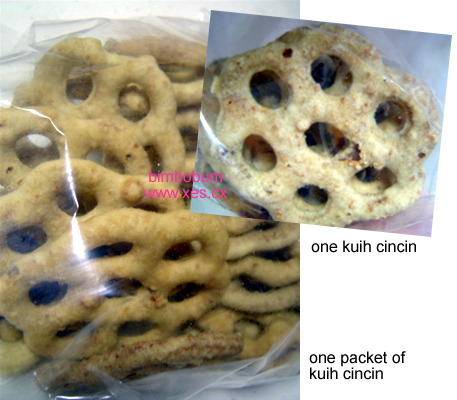 Some have asked if I could have my friend bring some more packets of kuih cincin for them. Apparently this kuih can hardly be found in West Malaysia. If so, it is hard and no longer fresh, according to one Malay colleague. I don’t know how true is this, but be sure to try it! As some of you may recall, I won a helmet during the Speedzone event @ ZOUK last month. It’s a Suomy Spec-1R Extreme Racing Capirossi – Size L, autographed by Loris Capirossi. I’ve put it up on Ebay. Starting price is US$600, which is cheaper than a brand new helmet of the same model. If you’re interested, please bid! The auction will end on Wednesday, 21 Nov, 2007 13:49:04 GMT.